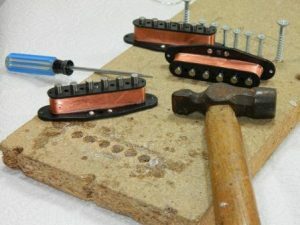 The first part of the building single coil guitar pickups blog focussed on initial checking and preparation of the pickups. That included hand setting the distinctive Hybrid pole piece stagger pattern. So now the pickups are ready for wax potting in a wax bath. 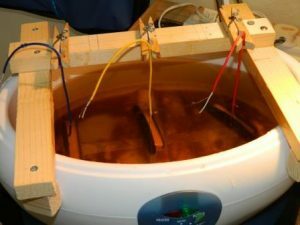 Wax potting is simply the immersion of pickups in hot, liquefied wax. Because the liquid wax penetrates into the wound coil, it drives out small air pockets. 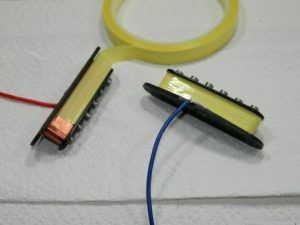 When the pickup cools, the wax 'solidifies' and thus binds all of the coil mechanically. This then stops the individual windings vibrating which causes the phenomena of microphonic feedback (squealing). Additionally, the pole pieces which were manually set are 'glued' in place by the waxing process. Wax is used because it moves between solid and liquid state easily, whilst retaining a 'pliable' solidity at room temperature. 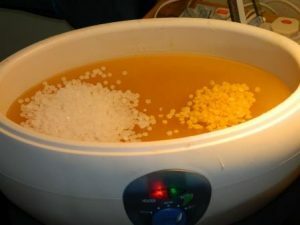 I use a 4 part paraffin wax to 1 part beeswax mixture, in the form of small easy melt pellets. These are visible on the un-melted surface of the wax bath below. 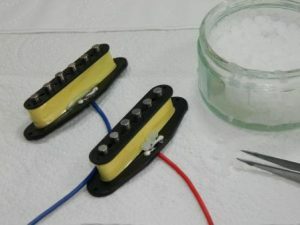 When building single coil guitar pickups of a higher resistance (thus more windings), the key stage is deep wax potting. The bath itself is a (relatively) low temperature unit, of the kind used for health / cosmetic wax procedures. The advantage is that the pickups can be left in for 20 + minutes, with little risk of any harm compared to higher temperature units. 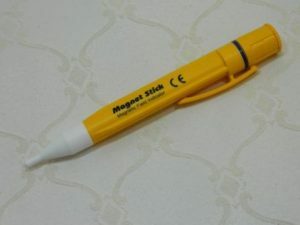 This ensures a thorough heat penetration throughout. A wooden jig suspends 3 pickups at a time (i.e. 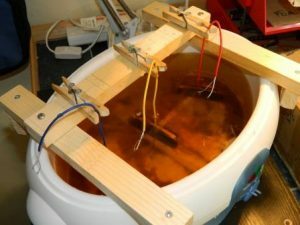 a Stratocaster set) in the bath, thermostatically held at a consistent temperature. An insulating cloth covers the top, preventing the wax surface starting to 'film'. After about 10 minutes, a few gentle taps on each pickup with a wooden (chop!) stick knock out stubborn air bubbles to encourage a full wax filling. After the timed immersion period, each pickup is withdrawn and a hot air gun used to blow off excess liquid wax. The pickups are then set to rest for a while on absorbent paper before the next manual steps. We visually inspect the pickups having cooled a little to ensure a full wax penetration and, if needed, that the wiring to the bobbin eyelets is not mechanically stressed. With everything OK, the pickups are taped. I use high temperature 'transformer' tape, which, when applied tightly, bonds to the still warm wax and copper windings. This both seals the coil to prevent mechanical damage and squeezes the still soft wax. That maximises the coil mechanical stability. With the taping in place, another electrical resistance check is done. 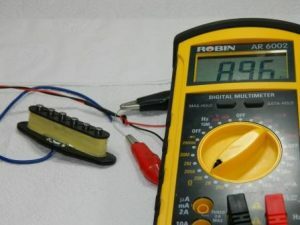 Because the coil is still warm, the reading is not accurate, but it will show that the coil and connections are all electrically intact. With the pickups confirmed as electrically sound, a mechanical cleaning can occur. The wax process leaves a thin film over the entire surface of the pickups. While the idea is not to completely remove that, some cleaning makes cosmetic sense. A fine emery pad is used to remove wax from the exposed pieces themselves and gives a bright visual finish. The rest of the resin is then lightly brushed with a scouring pad to remove any debris and unwanted wax deposits. Care must be taken at this stage not to brush across the small sections of exposed winding wire. We find the connection of the hair thin windings to the bobbin eyelets is the most delicate part of a completed pickup. So 2 or 3 pellets of the same wax that was used in the bath is carefully melted with a small soldering iron tip over the 2 eyelet joints. Once dry, this small wax coating prevents accidental handing damage, but remains soft enough to allow for mechanical movement and temperature changes. 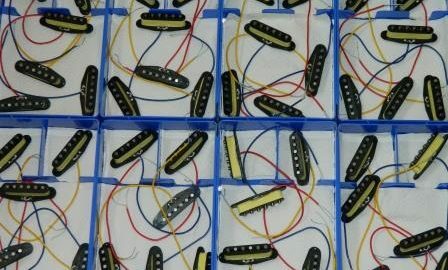 Building single coil guitar pickups like the Ironstone Hybrids in batches of around 20 pickup sets (60 pieces), gives about a day's worth of continuous flow wax potting. 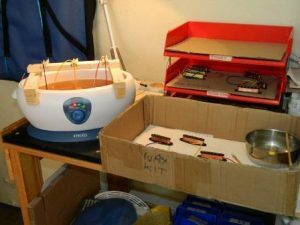 Because the potting process significantly heats the copper wire coils, they are then left to 'rest' back to room temperature overnight before a final accurate measurement. That confirms they are within the stated 5 % +/- tolerance. We can then package up the fully prepared pickups, with associated screws set, tubing and information card. 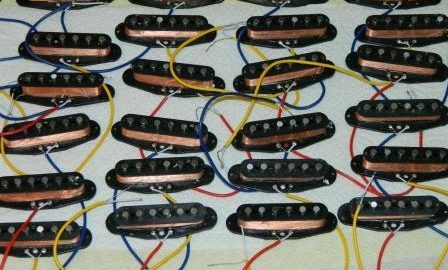 A new set of pickups is ready for Live stock! 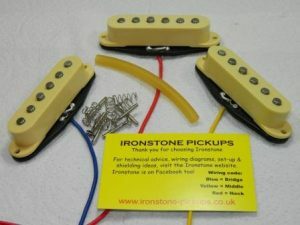 So that is the full process for building single coil guitar pickups here at Ironstone, like the Hybrids. 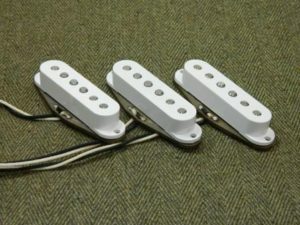 Different pickup styles have different operations (e.g. 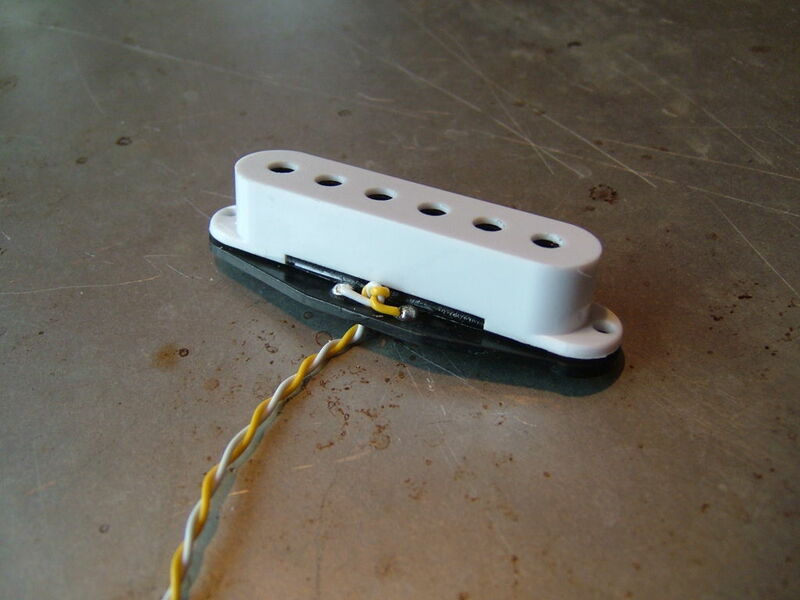 the Tele bridge pickup has a base plate hot glue process ). But the basics are the very much the same. I hope these 2 blogs give a good summary of what goes into the Ironstone Hybrid pickups. The latest, flagship vintage Strat pickups from Ironstone. For all playing styles and Artist tones from the fabulous early Fender era of the 50's and early 60's. Designed to recreate the warm, clear bell-like tones from a combination of original design specifications with a very modern mixed magnet twist. These combine wholly traditional elements; fibre bobbins, vintage stagger pole pieces, push back wiring and 42 AWG windings. But add to that a 'boutique' mixed combination of Alnico 3 and V magnets across all 3 positions, for a very special vintage Strat pickups tone and playing experience. These are available with white, cream or black covers and come with all mounting hardware. Supplied in a protective foam presentation box complete with Certificate of Conformity. So why bother with mixed magnet pickups? Well, opinions vary, but personally, I feel 80% of a guitars tone (excluding the amp / speaker set-up) is derived from its pickups, the rest from the mechanical construction, woods etc. And of that pickup tone, the magnet type is the major tonal contributor. 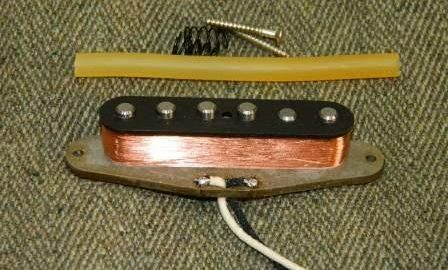 There are many other factors (see Ironstone's own Electric Guitar Pickups Explained), but the magnet type sets the basic 'palette'. So understanding how a mixture could influence tone offers interesting possibilities. 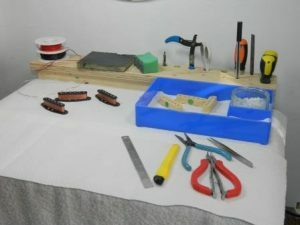 In the first part of this blog I will focus solely on Alnico magnets. I'll follow up with ceramic mixes later. 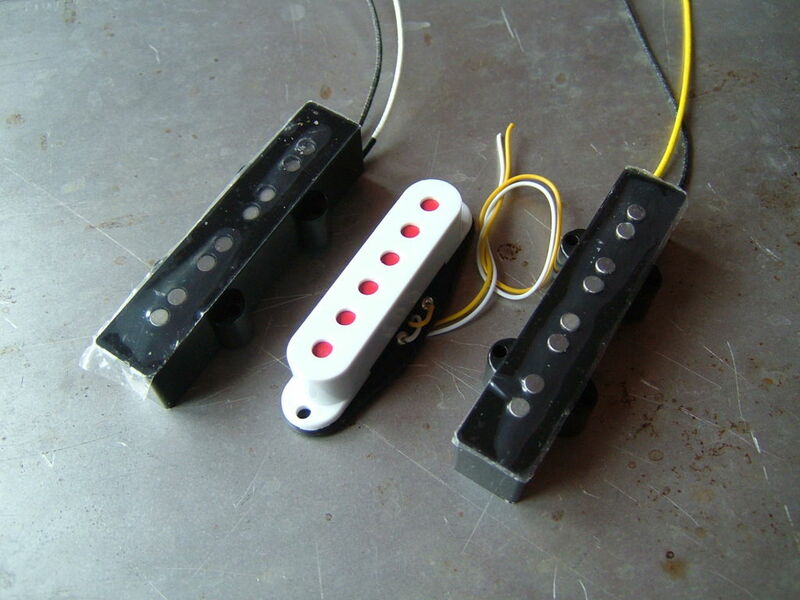 Based on A. R Duchossoir's Stratocaster and Telecaster histories, Fender originally used Alnico II and V. Alnico III is also now a little more common in mainstream pickups like the Tonerider Hot Classics. Alnico V; By far the commonest Alnico pickup magnet variant. The strongest of these 3, its well suited to bridge positions where the string vibration is smallest. Tonally its normally described as hotter, more aggressive and warmer in the mid-range. So a natural match for Bridge pickups and lead guitar work. 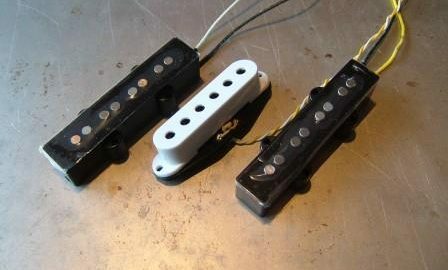 Alnico III;  The weakest of these 3 and actually has no cobalt in it (so its really an 'Alni' pickup!). With the weakest magnetic strength its ideal for the neck position where the string vibrations are strongest. A softer overall tone than Alnico V, but with great clarity and note separation. 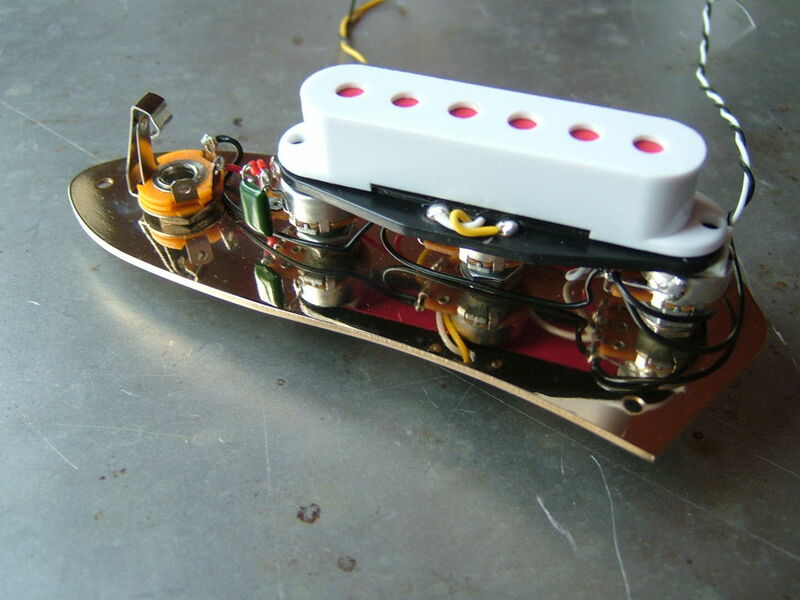 Alnico II; The grandfather of pickup magnets tracing its line back to the Telecasters of the early 1950's. Soft clear tones are the key to Alnico II, without any treble brittleness. So how can you mix it up? Using different magnets in different pickups. From an experimentation perspective (and mindful of budgets! 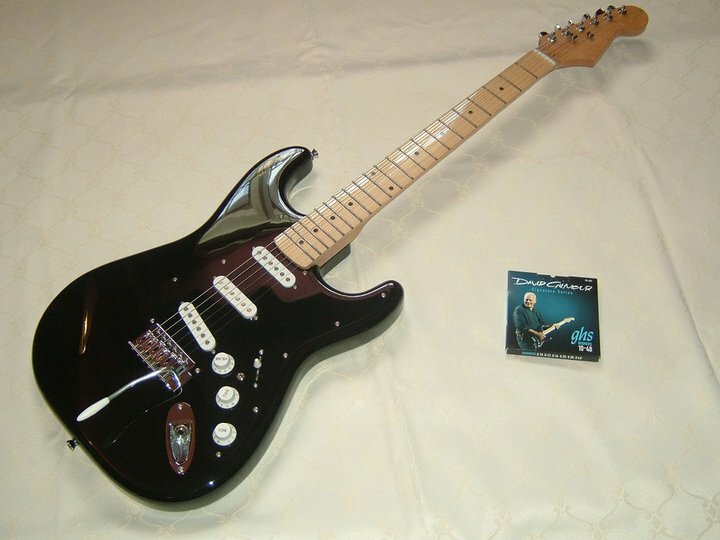 ), the easiest things to try are putting pickups based on different magnet types in the same guitar. Ironstone's own Telecaster set does that. 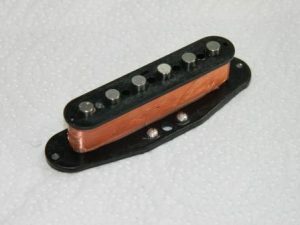 An Alnico V is used for the bridge to give the set 'bite' along with an Alnico III neck (as the Toneriders I mentioned before). The Alnico III neck gives a fuller bass and seems a better match to that ideal vintage 60's tone. 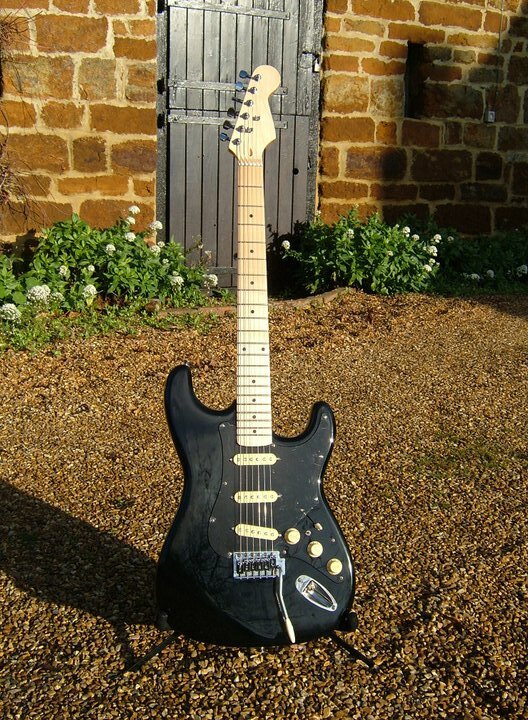 The Eric Johnson signature Strat set uses the same neck and bridge combo. 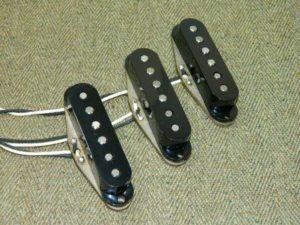 Otherwise its simply a question of scouring around for a second-hand set of different magnet pickups from the style you already have. 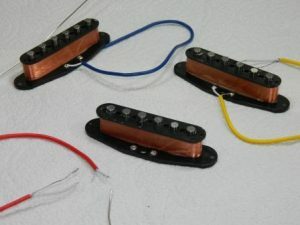 Using different magnets in the same pickup pickups. 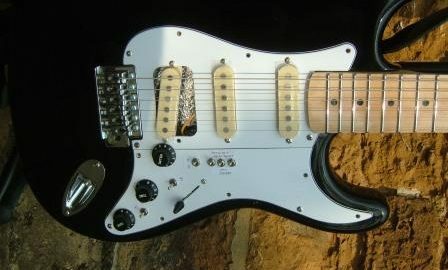 Thinking of Strat pickups, traditional fibre bobbin construction does not allow pole piece changing. 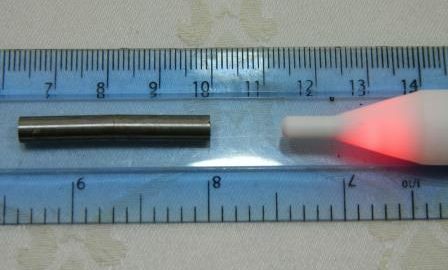 But with some care, in most plastic bobbin styles its possible to pop out magnets and place new rods in. 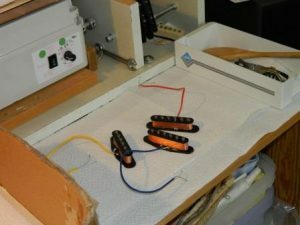 There is some risk of damaging the coils, so best practise on a cheap basic pickup! 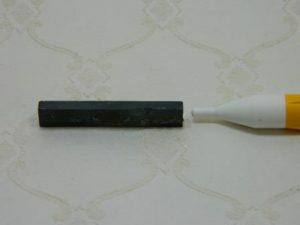 Simply tap the required poles out from the bottom using a small screwdriver tip and a small hammer, taking care not to touch any exposed coils with the screwdriver. New pole pieces (correctly magnetically orientated) can then be tapped back in, again from the bottom. So that gives the possibilities of putting (say) Alnico V magnets in the 3 treble slots and Alnico III for the 3 bass string pole pieces. That's a real 'boutique pickup' configuration! So there is some real fun and experimentation to be had by mixing up those magnets. 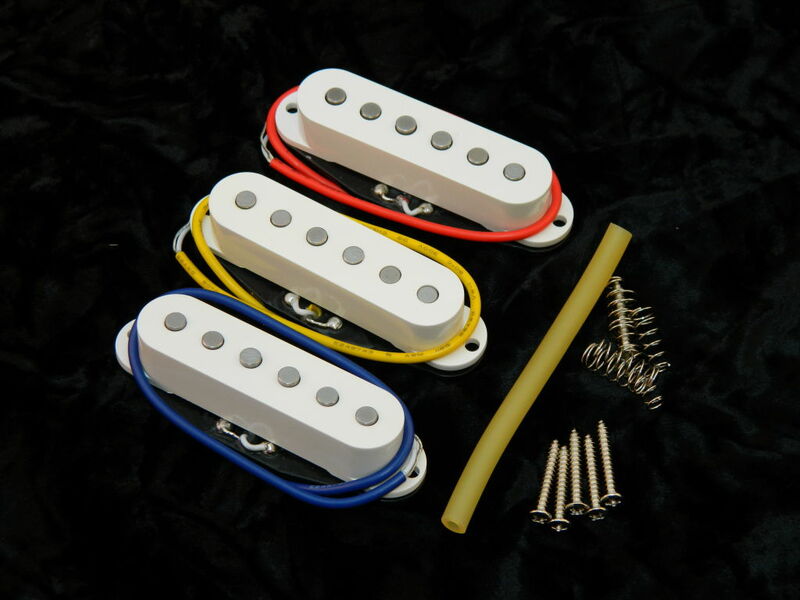 In fact its a bit surprising that more of the larger manufacturers don't offer mixed magnet pickups as standard! Since Ironstone Pickups began selling Jazz Bass pickups in 2015, its become clear that, just like with their 6 string counter-parts, Jazz Bass players love the warmth and openness of tone that comes from the Jazz Bass single coil pickup design. 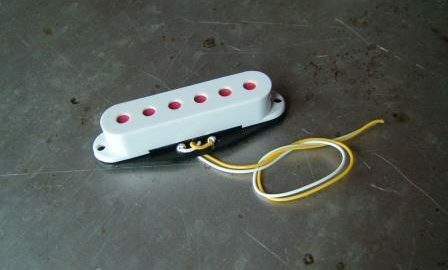 But as any single coil, they are also susceptible to the unwanted electrical noise that the pickup interprets as signal. Sadly us humans detect that as noise not signal! So assuming you want to keep your Jazz Bass tone and not opt for the Precision Bass humbucker pickup tone what can you do? In that Blog I divide guitar noise into 2 basic elements, low frequency hum and higher frequency buzz (pretty commonly used terms). The most effective 'answer' to buzz is shielding. See my Support page on the topic. Its aimed at 6 strings, but the principles are the same. Hum is linked to magnetic fields created by mains power circuitry, so dominated by the frequency of the mains electrical system (50Hz here in the UK for example). Shielding will not remove hum, for that you need noise cancelling technology, and that's where dummy coils come in. So coming back to noise cancelling, this simply means adding an electrical signal containing unwanted noise to another signal containing the 'negative' or 'inverse' of that same noise. 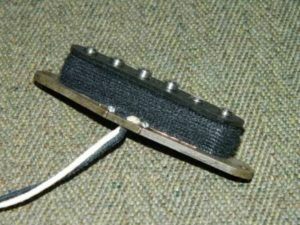 This cancelling (or 'bucking') of the hum is the principle of the humbucker design. So the humbucker (as found in a Precision Bass) is a very elegant hum cancelling solution, but the tonal characteristic is of course very different to that of a single coil. Enter the Jazz Bass dummy coil. So if you want your Jazz Bass pickups to keeps their tonal characteristic, where next? Well that is where the dummy coil approach comes in. 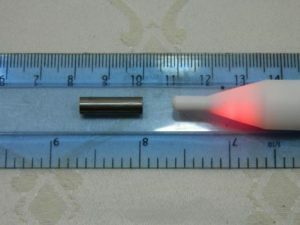 Basically, a dummy coil can simply be a single coil without a magnetic component. The key requirement is that the dummy coil has its windings and / or its physical up / down orientation arranged to be in opposition to the live coil(s). A dummy coil of around 80% of the live coils resistance value gives an excellent noise cancellation whilst leaving some 'life' in the signal which is so critical to single coil tone. Now the tricky bit to installing a Jazz Bass dummy coil is that unlike (say) a Stratocaster, standardly configured jazz Bass guitars use a volume blend system not a distinct switch. This is further complicated by the fact the 2 Jazz Bass pickups will typically be RWRP (Reverse Wound Reverse Polarity) to each other. 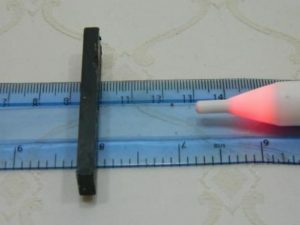 Since dummy coils have to be wound / connected in the reverse sense to the 'active' coil, the implication is that 2 dummy coils are needed. 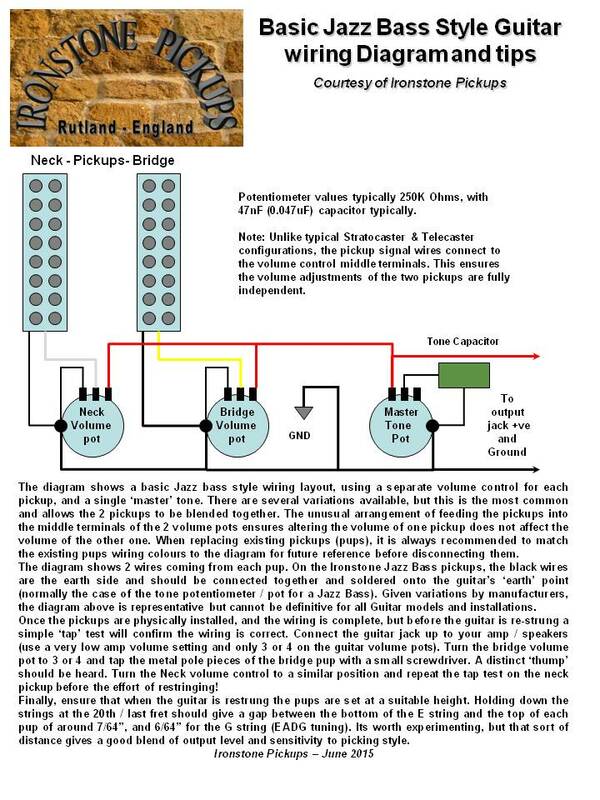 A standard Jazz Bass wiring schematic is shown below. 4) provide hum cancelling for both bridge and neck pickups across their full volume control range. 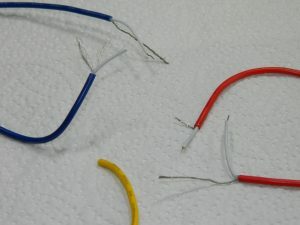 It took a bit of experimentation, but it is possible to achieve all of the above with a simple dummy coil installation. 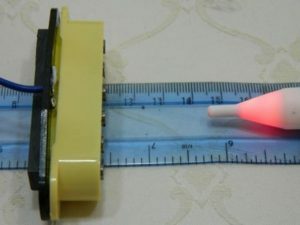 The dummy coil is based on a Stratocaster pickup and with the simple use of some double sided tape can be mounted on the base of the standard Jazz Bass control plate potentiometers. How does the Jazz Bass Dummy Coil sound? 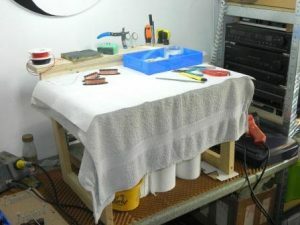 As with any dummy coil installation, the Jazz Bass dummy coil set-up gives a reduction in overall output volume (approx. 10-15%). This is not surprising as the dummy coil is effectively subtracting from the live coils signal. More importantly, a huge proportion of the background hum will have gone, for both the bridge or neck selected at any volume individually. The usual comment about dummy coils used on 6 string guitars is that the resulting tone has a drop in treble. It's a subjective view of course, and the associated drop in volume can add to that impression. Clear with the different frequency and harmonic register of a Bass guitar, any impact on treble is significantly less audiable. Once the volume is equalised out, you realise that there is really little tonal difference with the dummy engaged, except of course the welcome reduction in background hum. Check out the following sound clip to see. This sound clips give a sense of the hum reduction based on a test guitar where the dummy coil is able to be switched in and out. The recordings were made with the test guitar laying flat, giving the highest level of background mains hum (try this yourself!). It starts with the dummy coil off and a note played. After the note has faded, at 14 secs the coil is switched on giving the significant reduction in background hum. At approximately 25 seconds, the coil is switched off giving the jump in background hum. So the above prototype seems to fulfil all of the design goals set. 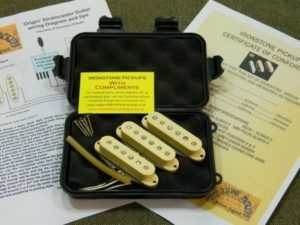 Hopefully, I will have it production ready a little later this year, and on sale through the Ironstone Pickups website. 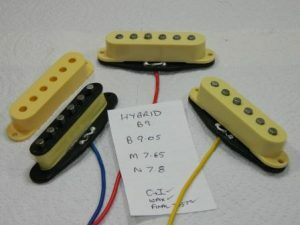 SSS HSH pickup conversions on a Strat can be quite a big deal, requiring body routing re-wiring and of course the selection and purchase of a set of Humbuckers. So what if you want the versatility and tonal qualities of one or 2 humbuckers but you don't want to lose the look and tone of your favourite Strat by changing pickups? Well there is a simple wiring modification that could get you to a very interesting SSS HSH solution. The basis of this SSS HSH wiring conversion is a wiring modification that when active, places a chosen pickup in series with whatever has been selected via the normal 5 way switch. 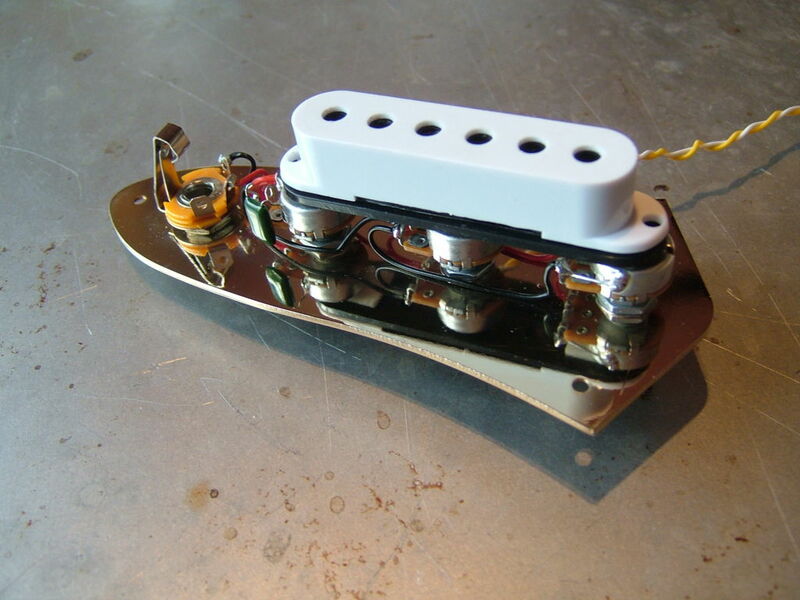 This modification is used on Ironstone's own Gilmour plate and Telecaster feature Bridge in series options. The following sound clips from the Ironstone Telecaster set demonstrate the single coil / series tone change. But for the SSS HSH modification, what is needed is to perform the modification as a 'middle pickup in series' configuration. This requires nothing more than a small change to the wiring and a basic SPST switch (e.g. a mini toggle or pot mounted push-pull). The wiring diagrams for this are available in several places on the internet, so rather than go through them again, use these excellent links. So you have done the mod, what switching options do you now get? If you want to get a little more adventurous still, you can consider adding some other switching to the number 2 and 4 positions, such as switching in different tone capacitors etc. 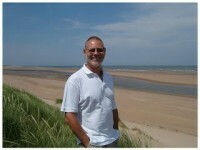 To do that you need to free up the second half of the 5 way switch and get inventive. See; 5 Way switching tricks & tips. In fact there is wealth of information out there on the web already, so I am not going to duplicate the brilliant efforts of others. Highlighted below are 4 of the best sites. Each has its own compendious listings of diagrams for every guitar and combination you can imagine! So dive in and see what is out there. 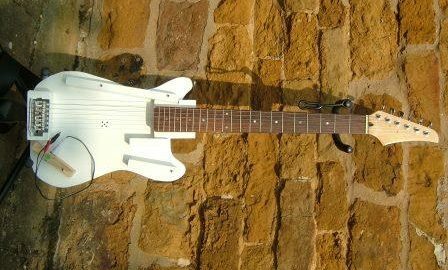 If you are serious about custom modding, its worth investing in a cheap and cheerful guitar just to experiment on, before your pride and joy gets some treatment. Enjoy! So maybe that HSH combination has been hiding inside your Strat the whole time just waiting for the SSS HSH wiring modifications. 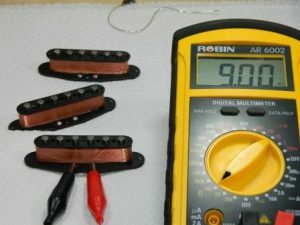 So here is the last and most complex bit of guitar pickup testing kit in this blog mini-series. 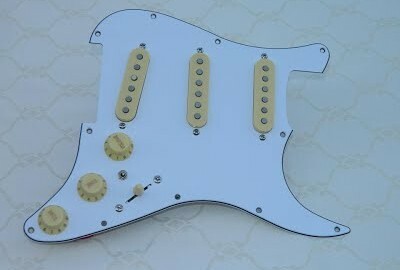 Unlike the previous examples, the idea here was to maximise the experimentation possibilities with Strat wiring. So the speedy interchangeability of the pickups is a secondary consideration. The key then was to have the ability to experiment and alter the control gear and wiring with the pickups (and strings of course) intact. Because the tone, and variations were much more important, this guitar also needed to play pretty well. So it was based on an inexpensive after-market neck and a solid body with swimming pool routing. Once again, I must say how useful the swimming pool routing is when it comes to guitars to experiment on. All that extra space makes wiring easier, allows more switch gear to be installed (and is great for all forms of active electronics and the associated battery). A few more switches than usual, but otherwise a fairly normal looking Strat clone. Note the 'split' line across the scratchplate, parallel to and just below the strings. Note the bridge slot can take a single coil or humbucker (that's silver foil cavity shielding you can be through the gap). The 5 way switch and volume / tone controls are pretty standard. Things do get changed about fairly often, and when these shots were taken, one of the mini toggles was a tone capacitor selector for A / B comparisons. I had never been convinced just how much tonal difference there was between different cap manufacturers.....). The main feature of the current switching set-up is the parallel / series configurators. With the S / P switch in P position, its a normal parallel configured guitar working off the 5 way switch. But put in the S position, it becomes a full series mode guitar. The 5 way is disabled and the row of 3 mini toggles allows any combination of the 3 pickups in full series. If you have never played or heard a series configured single coil guitar its quite a treat. Assuming it has the conventional RWRP middle pickup, you can get some impressive quasi humbucker tones (both in volume, 'fatness' and hum cancelling). Finally, a quick look under the covers. Here you can see the lower part of the scratchplate removed for access and the terminal block pickup connection method. Not recommended as a secure connection before you step in fount of a Stadium full of people, but great for ease of experimentation. The wiring around the switches themselves is of course an ever changing feast, and the best way to keep track is some form of updated circuit diagram. Though sometimes when you get an idea and a need to tinker, any kind of circuit diagram lags far behind! If you feel the need for some regular experimentation, its well worth having an inexpensive guitar modified for some easy(er) tinkering. And of course there are plenty of other cool examples out there too. 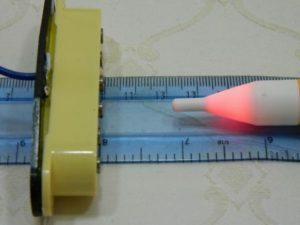 Part 1 of this Blog mini series explored a dedicated guitar pickup tester solution to allow individual or sets of pickups for a Strat to be quickly and easily inserted, played and thus evaluated. 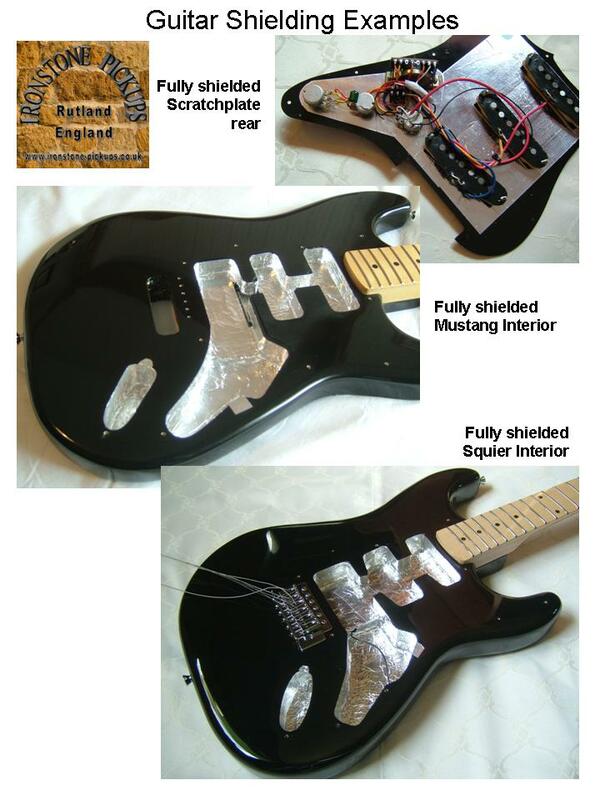 But what if you want to test a complete Stratocaster scratchplate / pickguard assembly? The same initial problems apply, i.e. the need to completely de-string to even get the plate off. So at Ironstone we came up with our own 'Skeleton Strat' guitar pickups tester solution. 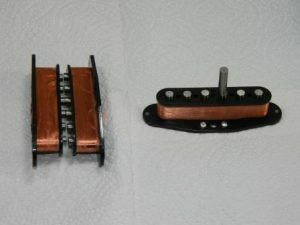 The criteria for this design was (similar to the guitar featured in part 1) a very quick way to mount and connect a Strat scratchplate in a 'playable' (we come back to that later) guitar mount. It was always anticipated that the basic Strat scratchplate could also be used to house other guitar pickup types or even configurations like a Telecaster too. After some tinkering, the Skeleton Strat was born. Cosmetics aside, its obvious all of the main bits of a guitar are present. It has a body (sort of!) and normal neck, a (fixed) bridge, strings and tuners. Its not a solid body of course, consisting of a back plate and a series of wooden support blocks onto which the scratchplate will be mounted. The tricky bit is how to get the scratchplate under the strings without needing to remove them first. There were some trails with  a mechanism to hinge the bridge up out of the way, but it was all getting quite complex. So a far simpler approach was finally chosen. 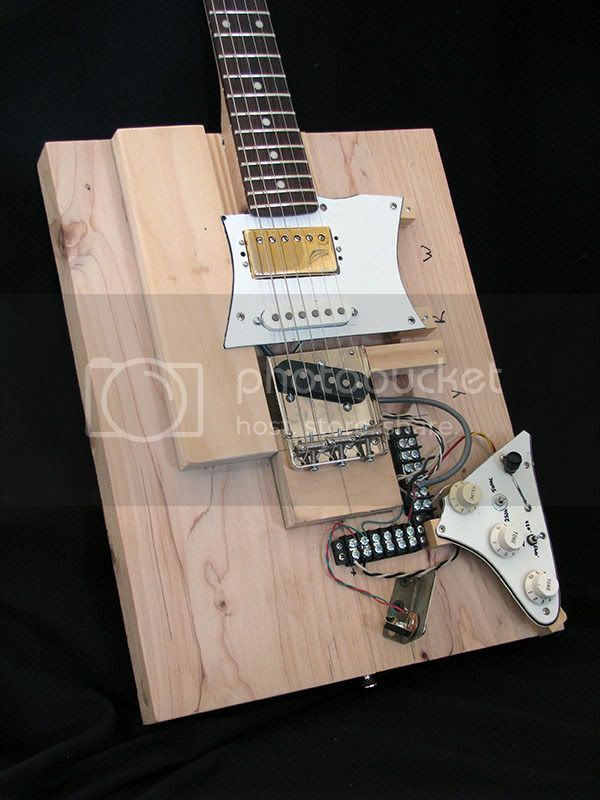 Not only are the wooden support pieces set low enough that a plate complete with pickups can go under the strings, but the small (natural wood finish) arm on the lower left of the photo also swings out of the way to allow the potentiometers etc to pass by. Its then simply swung back into place to support the end of the scratchplate. 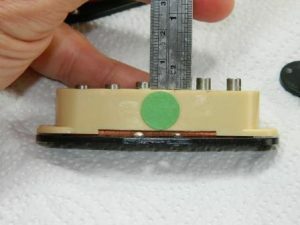 Four screws hold the plate firmly in place, and a pair of croc clips allow connection from the plate to the amplifier via a jack socket on the same arm. That's the Skeleton Strat guitar pickups tester. Coming back to that 'playable' comment there are 2 limitations / features of the design that are worth noting. Firstly, the string to pickup gap is considerably larger than on a conventional guitar with a proper height set up. That means the pickups are less sensitive to the string vibrations, but perfectly adequate to test a completed scratchplate assembly using 'known' performance pickups. Secondly (and more annoyingly), the bridge to nut length has had to be extended somewhat to allow for the plate to slide in. Consequently, intonation is not perfect, and playing higher up the fretboard gives some interesting results! 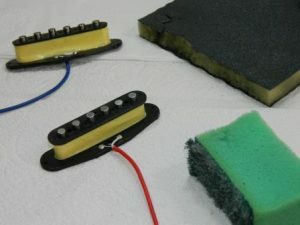 But even so, this allows a full check of not only the pickups, but all of the scratchplate controls, from basic switching to ensuring that pots are fully working and free from noise. Guitar pickup sustainers and many, many more. The Skeleton Strat truly has a life of its own when it comes to guitar pickup testing! For a few more ideas, check these out from the internet!